Used 1962 Chevrolet Corvette 1962 Frame Off Restored 340hp! for Sale in Indiana PA 15701 AutoSport Co. Trim: 1962 Frame Off Restored 340hp! 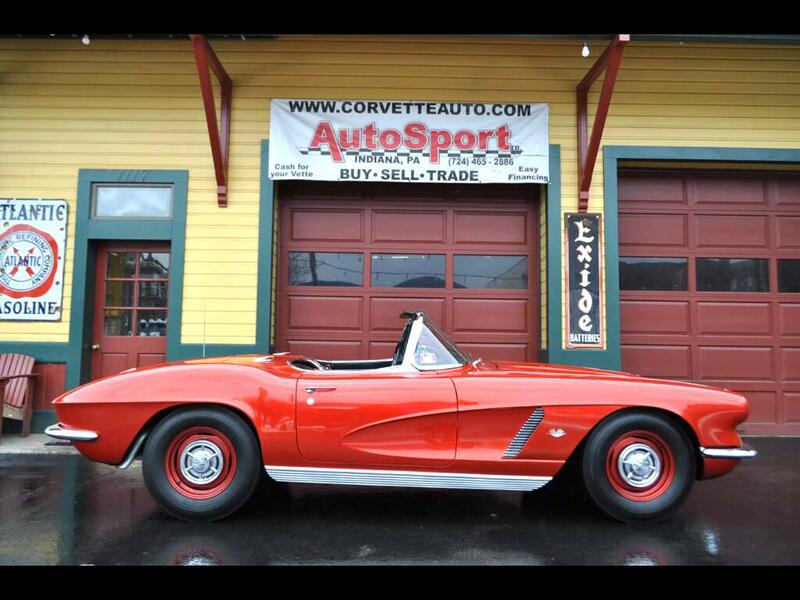 For sale a is a beautiful Frame Off Restored Honduras Maroon/Black 1962 Corvette Convertible. This is a southern car out of Texas and its previous owner had the car for nearly 40 years! The body is in excellent condition with good fits and clean consistent body lines. The Honduras Maroon paint is show quality and is over restored. The paint has some metallic in it that gives it a little more bling then what you would find in the original paint. The chrome bumpers and stainless steel trim are in good condition. The black soft top is brand new and is new. The Black interior has been restored to GM stock specs and shows extremely well. All new seat covers, carpet, and door panels have been installed. The gauge cluster has been restored and painted. The dash pad is new in excellent condition. The center console has been restored and looks great. The frame is a solid clean rust free detailed frame that has been restored and stenciled just like they did from the factory. There’s stenciling on the drive shaft, frame rail, and markings on the front end. The undercarriage is in excellent condition and shows extremely well. The engine compartment is stock in appearance, with the correct air cleaner, shielding, and stock engine components, but the engine has been rebuilt and is a strong powerhouse! The engine is rebuilt as a 340hp engine with solid lifter heads and you can hear that classic solid lifter sound from the engine. The powerglide transmission was also rebuilt and installed in the car mated to the high horsepower engine which would not have been a stock option for a 340hp Corvette. Inside the trunk compartment you’ll see the jack and jack tools that are original to this car, as is the truck board. These stock components are hard to come by. The previous owner installed correct small hub caps that you would find on a big brake car. With its black wall tires, small hub caps, and gorgeous paint this car has classic look that’s a real head turner. Please check out the video! Please feel free to call us at 814-977-9219 or email us with any questions.